Kyriakos Hizanidis is a Professor at the School of Electrical and Computer Engineering at the National Technical University of Athens (NTUA). He studied Mechanical and Electrical Engineering at NTUA, Greece (1975) and he got his PhD from Massachusetts Institute of Technology, USA, in 1982. His research activities refer to Thermonuclear Fusion, Plasma Transport and Kinetic Theory, H&CD in Tokamaks, Electron Beams and Accelerator Physics, Nonlinear Waves, Photonics, Solitons, Nonlinear Dynamical Systems. 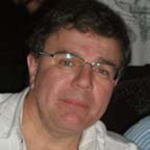 He has been Principal Investigator of NTUA Research Team, Association EURATOM-Hellenic Republic and Cyprus. Prior to 1999 he was Principal Investigator on research projects funded by the EU-EURATOM on Gyrotrons. He is currently the Director of the Laboratory of Plasmas, Electron Beams and Nonlinear Optics (POLARIS). Since 2009 he is Head of Research Unit of the Association EURATOM-Hellenic Republic and Republic of Cyprus. He has been National Representative of the Hellenic Republic at CCE-FU. He has 160 publications in refereed international journals and 85 in refereed conference proceedings. its evolution from its infancy to a full fledged National Programme.